The number of non-native players in the football leagues of Europe has climbed to record levels, with 36.1 per cent of all players being ‘foreign’ in the leagues in which they play, according to research released today. The CIES Football Observatory in Switzerland has looked at the precise make-up of every player at the 478 clubs in the top divisions of Europe’s 31 ‘biggest’ football nations, from England’s Premier League to Germany’s Bundesliga, Spain’s La Liga, Italy’s Serie A, France’s Ligue 1 and 26 other top divisions from Austria to Ukraine and all points in between. The results can be found in the extensive Demographic Study of European football, with a free downloadable extract available here, and the full report available for purchase here. This first graphic shows the extremes of the foreign invasion, from Cyprus, where 74.2 per cent of players are expatriates, to Croatia, where as few as 13.5 per cent of players are foreign. The number of ‘foreigners’ (defined as born outside that football association’s territory) is greater than 50 per cent in six of the 31 nations surveyed: Cyprus, England, Portugal, Belgium, Italy and Turkey. Brazil remains the No1 provider of expatriates within Europe, with 515 Brazilians spread across the 31 divisions, down from 524 a year ago. France (269 players in the 30 nations outside France), Serbia (205 outside Serbia), Argentina (188) and Portugal (171) remain in 2nd, 3rd, 4th and 5th places. Spain has risen to sixth place, with 148 Spaniards playing outside Spain, with Germany seventh highest exporter and Nigeria eighth. The second graphic shows how the leading expatriate suppliers have changed each year from 2009 to 2012, and plots the 2012 global map. The third graph arguably maps the quality of players across each respective league as a whole, measuring the percentage of full internationals in each league, defined as a player who made at least one first-team full international appearance in 2012. England’s Premier League has the highest percentage of full internationals (42.5 per cent) followed by the Bundlesliga (35.6 per cent), Russia (30.1 per cent), Italy (24.5 per cent), France (22.3 per cent) and Spain (20.7 per cent). At the other extreme, Slovenia’s top division contains only 1.2 per cent of full internationals. The fourth and final graphic looks in detail at the make-up of the Premier League’s demographics. (This kind of detail is available on a league by league basis for each of the 31 nations, within the full report). The foreign footballers in England are older than the English players on average by half a year (27 against 26 and a half); and the foreigners are taller (by 2cm), and are almost twice as likely to be full internationals. Of Premier League goalkeepers, 65 per cent are foreign; foreigners are least represented at full-back (50 per cent). The most common nationality of import is French (39 players) then Spanish (26). 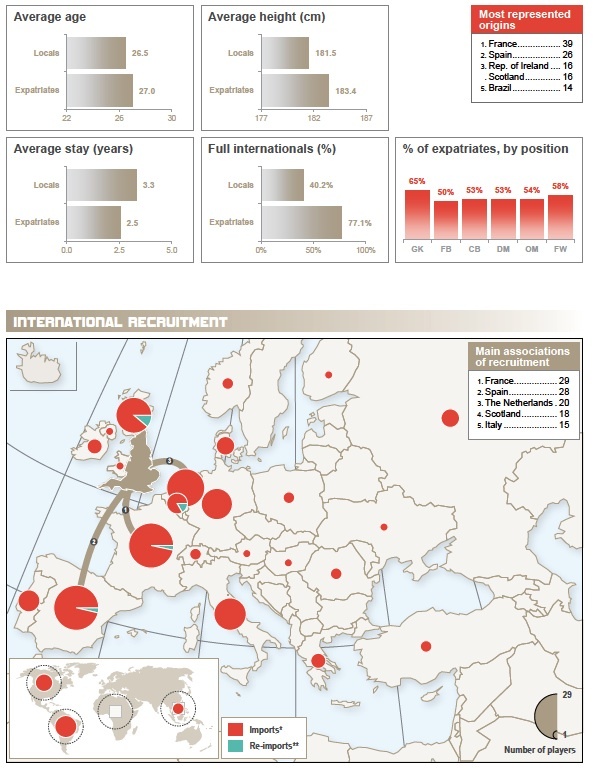 The most common country of recruitment is France (29 players, not necessarily French) and then Spain (28 ditto). The latest Football Observatory study also includes comprehensive club level data. For example, the Barcelona squad contains the smallest players (177.74 cm on average). In addition, the Catalan side is made up of the players who have been together for longest in the first-team squad, with five years the average. Two other Champions League possible winners are among the most stable teams: Shakhtar Donetsk (4.4 years, 3rd position) and Manchester United FC (4.3 years, 7th).